What do you mean I missed a mouse!? On first glance you might think this is just a normal cat, the kind that just sits around doing a whole lot of nothing all day. But you’re so very wrong. This is Felix. She is the official pest control manager at Huddersfield train station in West Yorkshire. She has a proper job title, a high-visibility vest, and even a name badge. Oh, and she just got a promotion, because she’s probably better at her job than you are at yours. Felix was given her smart new uniform last week when she was promoted by rail network Transpennine Express after five years of service, the Huddersfield Examiner reports. 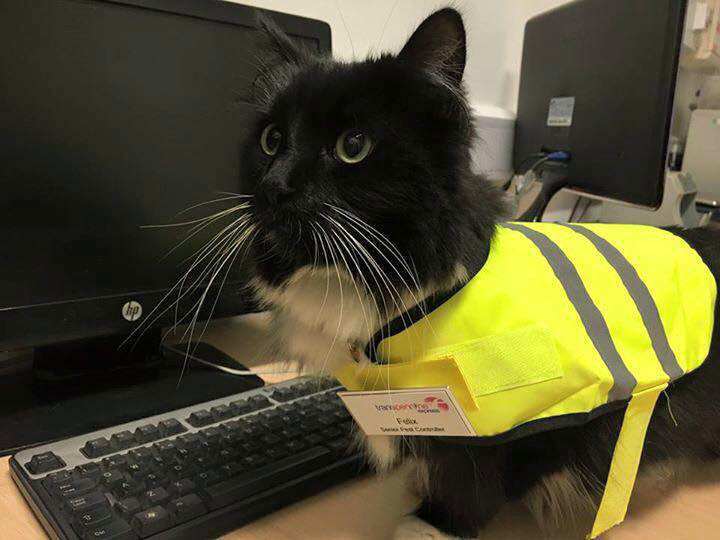 She was brought to Huddersfield station aged just nine weeks, and the black and white cat has become loved by station staff and commuters alike. Oh yes that’s the spot! Felix patrols the station’s platforms to keep away mice and even has her own cat flap built into one of the barriers, allowing her free reign over the entire area to carry out her duties. She’s probably the closest thing we have to Tama, a cat who was made a stationmaster in Japan, before tragically dying last summer. Bit of work in the office today. Lots of paperwork! Well, the fame hasn’t quite gone to her head. As with most cats, they already think the world revolves around them. She’s getting more treats and more attention, so all in all she’s very happy. She already has a substantial following online with more than 34,000 likes on her personal Facebook page – which keeps people up to date with her activities – with fans as far afield as Hong Kong, Taiwan and even across the pond in the U.S. Bit of a rainy start to the week here in Huddersfield. 3 pigeons already chased off Platform 1 ready for the 0640 Airport service. Stay dry and warm everyone!